Local chef and Ayurvedic Practitioner Shibana Singh introduces two classic South Asian dishes now found around the world: Biryanis and Kebabs! Biryani is a rice-based dish traditionally cooked in earthenware pots; a Kebab can be roasted or grilled with or without skewers. Demonstration. 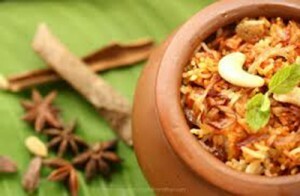 Chicken and Vegetarian Biryani with Raita – An aromatic layered rice dish. The layers are sprinkled with saffron water, lemon juice other spices making this dish a delicious blend of exotic flavors. Raita- A savory yoghurt side dish with Cucumbers, Mint, Tomatoes and Onions. This entry was posted in Events & Retreats and tagged classes, Cooking, Cooking Class, Food by shibana. Bookmark the permalink.